Robert Fenton's Photographic Van. Courtesy of the Library of Congress. Image available on the Internet and included in accordance with Title 17 U.S.C. Section 107. PHOTOGRAPHY IN CIVIL WAR TEXAS. The process of photography was discovered in France early in 1839 by Louis Jacques Mande Daguerre. The daguerreotype was introduced to America shortly thereafter, and one of its main proponents was Samuel F. B. Morse. By late 1839 a few talented individuals in New York and Philadelphia were experimenting with the process, and by the summer of 1840 the new art form had spread to many of the major American cities. It caught on quickly and spread down the Atlantic seaboard to the coastal southern states and along the Gulf of Mexico to cities such as Mobile, New Orleans, and Galveston. The earliest professional photographers in Texas operated along the Gulf Coast, and many were itinerants. As settlements were formed inland, the photographers followed. Union Photographic Tent during the Civil War. Courtesy of the Jane Van N. Turano-Thompson Collection. Image available on the Internet and included in accordance with Title 17 U.S.C. Section 107. 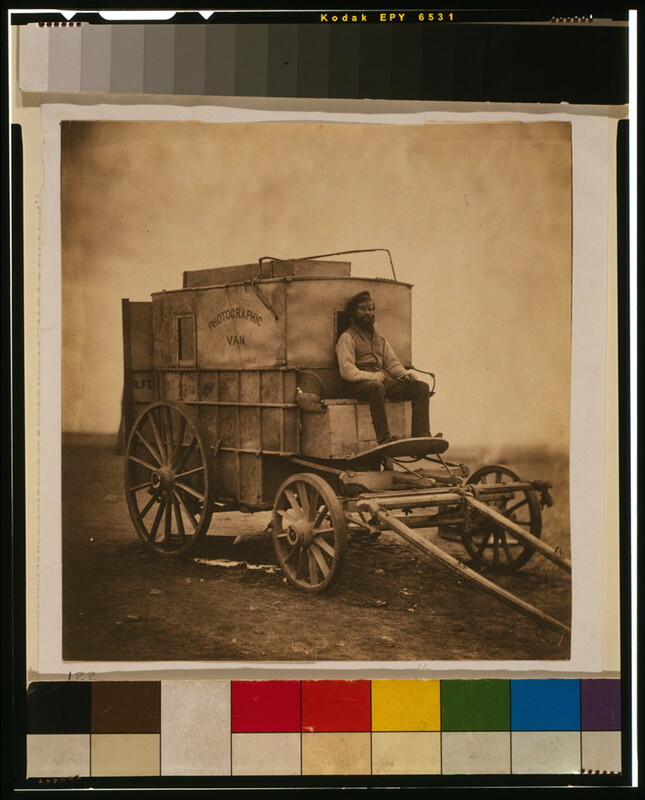 From 1840 to the beginning of the American Civil War, at least 118 photographers were working in Texas, and by 1860 many Texas communities had permanent photographic galleries. Texas was not unlike other states, both North and South, in that the Civil War crisis brought about a boom in certain types of businesses, photography being one of them. As the young men of Texas volunteered for Confederate military service, many found themselves leaving home and traveling relatively great distances for the first time in their lives. Partially to commemorate their service and departure and also to leave a memento with a loved one, it became customary for the volunteer soldier to go to the nearest photographer to have his "likeness" made. It was also a common practice for a soldier to carry one or more photographs of his wife, children, or other family member when he left home. During this period, the overwhelming majority of photographs made in Texas were studio portraits of individuals. On rare occasions, views were taken outdoors, and some scenes were produced, but extant examples are almost impossible to locate today. With few exceptions, the types of photographs that were made in Texas during the Civil War were ambrotypes, tintypes, or cartes de visite portraits. The ambrotype was a photograph made on a glass plate. Basically, it was a collodion or "wet-plate" negative that was made into a positive image when backed with black cloth, varnish, metal, or even paper. Some were even made on a ruby-colored glass that helped turn the negative into a positive photograph. Each ambrotype was one of a kind. If a soldier wanted more than one copy, he had to sit for another exposure or have the original ambrotype copied. The tintype was also a unique wet-plate process in which the emulsion was coated on a sheet of black japanned iron to produce a positive image. The thin metal plate of the tintype was more durable than the glass plate ambrotype, and tintypes became quite popular during the war. Both ambrotypes and tintypes came in sizes ranging from 1 3/8 by 1 5/8 inches to 6 1/2 by 8 1/2 inches. They were usually framed by a brass mat over which a protective cover glass was placed and then housed in a miniature case that further protected the fragile image. However, it was the carte de visite (French for "visiting card" or "calling card") which surpassed all other forms of photography during the war. This form of wet-plate photography was a small size albumen paper print, usually 2 1/4 by 3 1/2 inches, that was mounted on a 2 1/2-by-4-inch card. The carte de visite, or CDV as it is commonly called today, involved the creation of a negative from which multiple copies of an image could be produced. That alone gave the carte de visite a tremendous advantage over earlier photographic processes, and a soldier could have as many copies made as he wished. Sometimes the soldier posed without armament or even a uniform. But, as often as not, he posed with weapons to emphasize the seriousness of his military bearing. The most common weapons seen in images of the period are longarms such as muskets and shotguns, followed by revolvers and the large personal knives known as "side knives" or Bowie knives. The Confederate volunteer sometimes was posed and photographed with a combination of all of these types of arms. In numerous instances, a photographer would supply "prop" weapons if the soldier had none available for the occasion. The overwhelming majority of Civil War era photographers in Texas did not sign their work. It is rare indeed to find an 1861–1865 Texas photograph that is identified by artist or maker. However, a few examples do exist, and more often than not, a single example is the only example known of a given photographer's work. Isaac Cline, a Texas veteran of the1846–48 Mexican War, advertised his services as a photographer in San Antonio before moving to the East Texas town of Palestine to open a gallery there. In July of 1863 Cline took a remarkable photograph that epitomizes the significance of photography during the Civil War. A local lady and schoolteacher named Josephine "Josie" Scott walked into Cline's gallery and had an ambrotype of herself made to send to her absent soldier-husband. Mrs. Scott posed while holding and displaying for the camera an ambrotype of her husband, Lt. John G. Scott, in his Confederate uniform. Scott was serving with the First Texas Infantry Regiment in Gen. Robert E. Lee's Army of Northern Virginia. The ambrotype of Mrs. Scott is significant not only because it is identified by subject, but by date and photographer as well. Cline surely made other photographs in Palestine, but his stunning and poignant ambrotype of Josie Scott holding her absent husband's portrait is the only known example of his Civil War work. During the same year he took Mrs. Scott's photograph, photographer Cline served himself for six months as a member of Company B. First Regiment Cavalry, Texas State Troops. His regiment was one of several raised in Texas by the state and was under state authority rather than the Confederate government. Cline saw no combat and was assigned to duty as an "Assistant Forage Master" at Velasco on the Texas Gulf Coast. In nearby Tyler, a twenty-five-year-old Tennessee native named John M. Hill was operating a gallery he called the Sky-Light Photographic and Ambrotype Rooms. On June 10, 1861, Alf Davis, a Tyler member of Douglas's Texas Battery, had his ambrotype made in an unnamed local gallery. Because of a written reference to "Mr. Hill's gallery" by battery commander James P. Douglas, it is likely that Hill took the photograph of Alf Davis, along with other photographs of members of this soon-to-be-famous Texas light artillery unit. Solomon Thomas Blessing and his two brothers, Samuel T. and John P., worked in the photography business in both Galveston and Houston in the late 1850s and throughout the war years (see BLESSING BROTHERS). However, during the war, Solomon Blessing left the gallery in the hands of his brothers while he served as a private in Company L, First Texas Infantry Regiment of Gen. John B. Hood's famous Texas Brigade. It was a different company, but the same regiment in which Josie Scott's husband served. Blessing was wounded four times but survived the war and upon his return to Houston went back into the photography business. His career as a photographer went on for another thirty years. Another little known but significant photographer was William Bridgers, who operated a gallery on Pecan Street in the state capital of Austin. In 1860–61 his gallery was the place to go in Austin to have your photograph taken. Bridgers photographed many members of the important 1860 Texas Secession Convention, including the firebrand secessionist and future Texas governor Oran M. Roberts. When former Comanche captive-tribal member Cynthia Ann Parker was "recaptured" from a Pease River camp by Lawrence Sullivan "Sul" Ross and his command, she eventually was transported to Austin. The purpose of her visit was to secure a pension for herself that would help her readjust to Anglo frontier society. During her stay in the capital city, some prominent local women dressed Parker in nice clothing and then took her to Bridger's gallery to have her tintype made. At the same time, Bridgers also photographed a Comanche boy who was captured at the same time as Parker. By doing so, Bridgers unknowingly took one of the earliest known wet-plate photographs of a Comanche Indian in North America. In his postwar memoirs, Rags and Hope: The Recollections of Val C. Giles, Four Years With Hood's Brigade, Fourth Texas Infantry, 1861–1865, local Austinite and Confederate veteran Giles remembered visiting Bridgers's gallery to have his ambrotype taken. Giles was wearing his new gray uniform with black braid trim. After letting his father buy him a "monster" size hat, his father "marched" him to "Bill Bridges' [sic] "picture gallery." Giles recalled that while Bridgers placed him in position for the ambrotype, he suggested to the new volunteer that he would look more "fierce and military" if he pinned one side of his hat back with a metal star. Bridgers just so happened to have a box full of stars that he sold for one dollar. With his father's approval, Giles bought the star and the hat was pinned up on one side. The ambrotype was made, and the photograph appears on the dust jacket of Giles's memoir. Itinerant photographer A.G. Wedge was operating in Galveston by April 1861. A carte de visite photograph that Wedge took of Gen. John B. Magruder includes a Confederate first national flag as part of the design of his imprint. To date, it remains the only extant example of a wartime Texas photograph using an imprint that clearly indicates that this photograph was taken in a Confederate state. Wedge would eventually work his way down the southern coast of Texas and would operate in the Brownsville area where he is believed to have taken studio views of Gen. Hamilton P. Bee and several members of his staff. One of the most important Civil War Texas photographers was a Prussian-born immigrant who barely operated within the borders of Texas. Louis De Planque operated photography galleries on both sides of the Rio Grande in both Brownsville and the sister city of Matamoros, Mexico. De Planque arrived in Mexico about the same time of Maximilian's forces during the French intervention. He was a superb artist who took many rare outdoor scenes. He also photographed many of the principals involved in the complex military affairs resulting from the French invasion and various Mexican warring factions at the same time he was photographing Confederates and Federals just across the river in Texas. In fact, the conflict along the Lower Rio Grande Valley of Texas is the best photographed theater of operations in the state. De Planque made outstanding studio portraits of Mexican military leaders such as Tomas Mejia, Servando Canales Jeronimo Trevino and Mariano Escobedo. He also took the only known photograph of Texas frontier icon and Confederate Col. John S. "Rip" Ford wearing his Confederate uniform. As the war began to wind down, Texas Confederates slowly drifted back to Texas on foot, on horseback, and by boat. A substantial number of photographs of returning Texas Confederates were taken in cities such as New Orleans where photograph galleries were plentiful. Some of these veterans actually took up the practice of professional photography upon their return from the war. Photographers such as Hamilton B. Hillyer and Harvey R. Marks had served with local Texas state units during the war. Samuel B. Hill and William J. Oliphant served in hard-fighting combat infantry regiments during the war before turning to photography as a postwar career. Shortly after the war, Oliphant took a photography apprenticeship with true masters of the art. He learned the craft from Alexander Gardner and Timothy O'Sullivan, two well-known pioneers at war photography, by studying with them in Washington, D.C., before returning to Austin to open his own gallery. Within five years after the war, literally hundreds of photographers were entering Texas, and a new generation of photographic work was beginning. See also PHOTOGRAPHY. David Haynes, Catching Shadows: A Directory of 19th-Century Texas Photographers (Austin: Texas State Historical Association, 1993). Lawrence T. Jones III., Confederate Calendar (vols. 1–32, Austin: Confederate Calendar Works, 1976–2007). Ross J. Kelbaugh, Introduction to Civil War Photography (Gettysburg, Pennsylvania: Thomas Publications, 1991). Peter E. Palmquist and Thomas R. Kailbourn, Pioneer Photographers from the Mississippi to the Continental Divide: A Biographical Dictionary, 1839–1865 (Stanford, California: Stanford University Press, 2005). Robert Taft, Photography and the American Scene: A Social History, 1839–1889 (New York: The Macmillan Company, 1938). Jerry Thompson and Lawrence T. Jones III, Civil War And Revolution on the Rio Grande Frontier: A Narrative and Photographic History (Austin: Texas State Historical Association, 2004). Handbook of Texas Online, Lawrence T. Jones III, "PHOTOGRAPHY IN CIVIL WAR TEXAS," accessed April 20, 2019, http://www.tshaonline.org/handbook/online/articles/kjp04. Uploaded on February 24, 2011. Modified on June 22, 2017. Published by the Texas State Historical Association.